I'm not as nuts over linear holos as a lot of the polish people I know. At one point I even swore I was done buying them. The ones with colored bases always seemed disappointing and I already had enough silver, gray, and black. I was done. Except...I wasn't. I wound up buying three of the Born Pretty Store Holos and loving them. Again I felt pretty much done where holos are concerned. 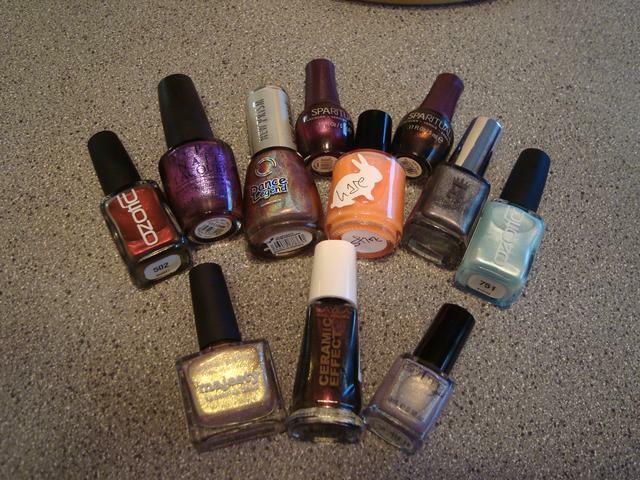 Then waterqween on MakeupAlley offered to send me Picture Polish Majesty and "some extras" that she was purging from her collection. I was grateful and felt giddy enough thinking that Majesty would soon be mine...and then the box came. It was...heavy. Like...really heavy. I'm amazed I didn't pass out from shock and delight when I opened it. I probably screamed like a kid of xmas morning as I unwrapped one amazing polish after another. Seriously...look at what she sent me! [Actually, I bought the Layla myself. It just arrived the same day...but still.] Majesty is waiting for a special day that's coming up soon, so I knew what I was wearing first. The Dance Legend New Prisms collection drew a lot of attention from the holo fiends, but the one that really caught my eye was Robots Vs Humans. I'm wearing it now and I'm still kinda stunned that I even own it. Thanks again, waterqween! Robots Vs Humans is a linear holo with a coppery-brown base. I know I say this every three weeks or so, but I am in LOVE! Perfection in a bottle! This is just ONE coat! It goes on perfectly, without any of the pampering that some holos need. Dries very quickly, but that's fairly normal for holos. It plays well with top coat too. I put Out The Door over it without any serious dulling. The single negative thing I can say about it is that it's stinky when wet. REALLY stinky. It smells exactly like spray paint and it gave me a bit of a headache. I don't even mind. The smell fades as it dries. I've been wearing it since Friday and I'll be sad to change it tonight. It's at its most glowingly vibrant in LED lighting, of course, but it's got plenty of oomph in sunlight and even some in indoor lighting too. For me the big challenge with any holo is how it looks when it doesn't have any flame at all. In this case that's rare. (They're even there under a car's dome light at 3am!!) I had to actually try to get a shot of it without any. It's a bit on the frosty side in those situations, but nowhere near as dull and unflattering as many. That's not really an issue though, since it's almost always got at least a hint of flame. Even at my desk here in a corner, there are subtle rainbows. It's gorgeous and flattering in pretty much any light and I'm deeply smitten. I've even worn it to work the past few nights. When the rainbows are soft, it's right on that border where you might call it work-appropriate. No complaints from the higher-ups. Makes a great polish that much better! I feel like no holo post by me would be complete without an edge-on LED shot, so here's that to wrap it up. Bottom line: Outstanding beauty and easy to work with, but stinky while wet. Then there's the price tag. Dance Legends are imported from Russia and like a lot of imported brands, that means they're up there. Both Llarowe and Ninja Polish have the New Prism line for $13 each...but they're sold out. Would I pay that myself if I hadn't gotten this as a gift? Honestly...I might! It's more than I've ever spent on a single bottle (I've come very close to $13 though) but Robots Vs Humans is so gorgeous, flatters me wonderfully, and I feel comfortable wearing it to work. If you're gonna spend $13 on a single polish, this would be one of my strongest recommendations. Thanks again, waterqween!! ...which leads me to ask, what's the most you've ever spent on a single bottle of polish? For me it's just under $13 each for a few black label OPI's. What a nice present to find in the mail ! Did you get Layla Chocolate Truffle ?? I'm excited to see that one. Awesome name, reallyreallyreally awesome holo! Also awesome is the fact that it behaves itself during application. Looks worth the price, to me, but what a great gift! Yeah, it's an absolute WIN! I'm still so stunned by what she sent! The most I've ever paid for a polish was 10 bucks. I've spent $14.99 on a couple butter London polishes. Not sure if I'll be buying much more of those though! Too expensive! I like the Butter London shades I have, but I got them for an absurd deal last summer.